To my buddy who died last week at the age of 11. Your girlfriend Rose and your cat miss you. Baldwin was a special needs dog, although I never thought of him that way. When I got him from the rescue he was 6 years old and had just been diagnosed with hip dysplasia. He couldn't walk around the block, but if he saw a squirrel, I couldn't hold him back. I understand from the rescue that the previous owner had left him in the backyard, chained up. I think they expected an attack dog, instead they got Forest Gump. Baldwin didn't bark. In the 5 years I had him, he never growled or showed any aggression. The female I adopted him with, Lady, died after a year from a stroke. I didn't know dogs could die from a stroke, I guess I didn't think about it. Baldwin was lonely and I got him another girlfriend, Rose, who is outside laying in the sun. Baldwin developed a hematoma on his ear and had to have surgery, his right ear fell over. Shortly after that I dragged two German Shepherds and a cat from California to Washington state for my job in a Toyota Camry. We made it. 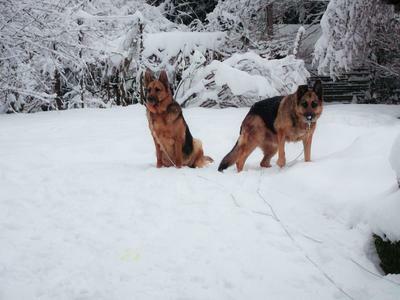 The dogs had never seen snow. Baldwin is on the right in the picture. After arriving, Baldwin developed some eye problems and was in the process of going blind when he passed. He developed a tumor on his tail and had to have his entire tail removed. Throughout it all, he was happy. Why would I get a dog with so many problems you ask? I would do it again in a heartbeat. To have a goofy dog who followed me everywhere who thought the sun wouldn't come up until I got out of bed is what I live for. I could not have found a happier guy to make part of our lives. I emailed the rescue and I am getting two more. It is what I feel I need to do. Yes, it hurts, but there are more out there and I will love them and pay tribute to Baldwin. He had a crappy beginning, but a good ending. That is all I can hope for. As I sit here trying to type with tears in my eyes I remember how thankful I am for people like you that take the unwanted and the tossed away and give them a reason to live and a sense of hope and a feeling of being wanted and loved. Thanks God for people like you who rescue these babies that need help - I am so appreciative of your gifts. Baldwin took a while to get to his forever home but I am sure despite all the health problems that he was happy to be with you and loved you to his core. I wish you nothing but continued success and if you ever get the time and want to share your new rescues, please do. We would love to see your new fosters. This weekend a friend called me. He is in the Navy and speaks 8 languages. He and his wife will be moving to Japan, that is where the Navy says they need him to go. He has a five year old German Shepherd. The dog will have to stay in quarantine for six months so he has asked if I will take him so he won't be put through that. If my remaining female Rose doesn't object, he will become a new member of my family. Next summer I will be buying a house with some land and will get two more dogs. Baldwin would be happy.